It’s one thing to believe in the promise of a child; it’s a whole other kind of gift to see that promise lived.Earlier this year we introduced you to eight-year-old Betsega — one of the 175 kids beneﬁting from a Roots Ethiopia school sponsorship.Thanks to your support Betsega is able to attend the well-regarded Rohot Academy in Hosanna. Who is Betsega? He is the oldest of three; the son of a father who works as a day laborer and a mother who sells coffee, injera and homegrown vegetables at the night market; a boy who loves soccer; a young entrepreneur who used one month’s of Roots Ethiopia support (275 birr) to purchase four chickens that he tends in a coop he engineered himself. His devoted efforts mean the coop is now home to two baby chicks as well! Without the Roots Ethiopia sponsorship, Betsega would soon be forced into day labor himself. 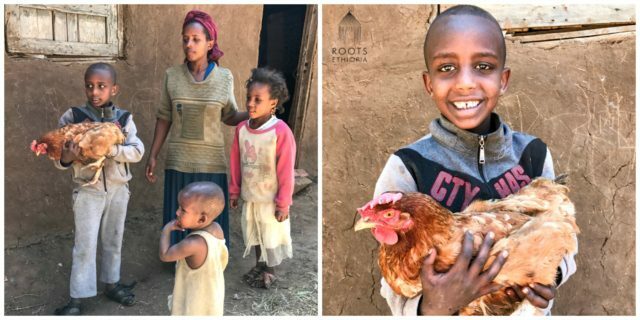 Instead, he can spend his childhood dreaming and studying and working with his chickens. Here, completely in his own words, is a day in the life of Betsega. I help my Mom while she works to get ready to leave for the market with her injera. I make coffee and anything else she needs me to do. I am good at making coffee! At 6 I start reading and I study until 8 when my Mom returns. I help make dinner and roast the coffee. For dinner we might eat potatoes (dinich), kocho (local food), vegetables (gomen), and corn bread. Then we all wash our legs and go to bed. Sometimes I am too tired to wash my legs and I fall asleep, so I’ll wake up and feel my Mom washing my legs for me. This is the type of productive and safe day we wish for every child. An annual commitment of $250 will go far in the year ahead, not just in miles to rural schools where Betsega and other school sponsorship students live, but far into their everyday lives. Are you ready to educate children in Ethiopia? If so, please SHARE this with others who might want to learn about the benefits of an Ethiopian education!